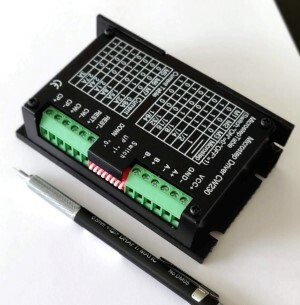 Here are the CNC control electronics that you will need to make the CNC Router move! I am offering a bundle of components as shown below and individual products. This equipment will have the power for the CNC router kits that I offer on the main sales page. This system will also enable many other CNC retrofits. 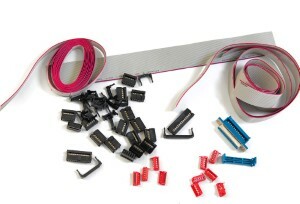 This bundle would be used in cases where there is one stronger motor needed. In most cases, this larger motor is used to move the gantry as this would be the part of the machine that is heavier or has the most inertia. This is a 3 axis electronics system with a 100 oz-in stepping motor for smaller CNC and 3D printer machines. 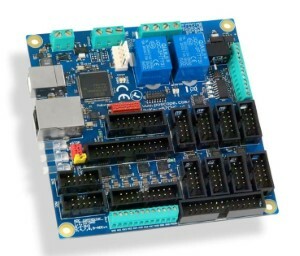 One of the most important components included is the CNC controller also called a brekout board. This little gem allows you to interface your computer to the stepper motors using the USB, parallel port, or even an ethernet cable. This is the cable pack for the Pokeys57CNC motion control board. The relay board will turn on standard electrical devices up to 12 amps and 250 volts using a standard 5v signal. 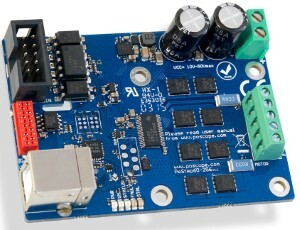 This USB Controller will run Mach3 through a standard USB port on a PC. Sold and shipped next day or quicker from the United States. Warranty and support available. Do you have a signal wire that you need to invert. This integrated circuit takes a low signal and brings it high, and takes a high signal and brings it low. 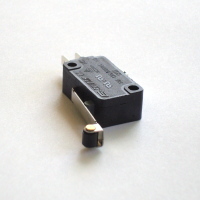 Do you need a really small 24V Power Supply for your next project? Consider this 1 amp 24 volt DC power supply great for powering low current or digital applications. Connect this power supply to an 80 Watt CO2 Laser Tube to create the lasing. 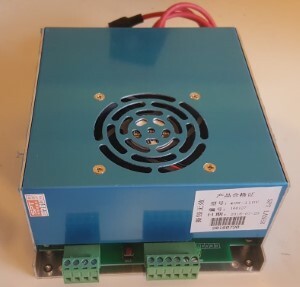 You will need a power supply to power stepping motors and drivers and these 36 volt and 24 volt power supplies will deliver what the drivers and motors need. Use these larger extremely versatile rotary limit switches on your CNC. The action of these switches are rotational, so the lever arm can be mounted in a way that the switch can be actuated and not interfere with the structure that is pushing the lever. I know, you are finished building the CNC machine, and now, you need to set up the limit switches and be able to home the machine. Limit switches serve as the mechanism that tells the computer the limits of the CNC machine. When one of the axes moves to an axis limit, the switch is activated and the machine stops. These limit switches are also use to inform the computer of the home position. This is the cable that carries the signals from the computer to the CNC electronics. 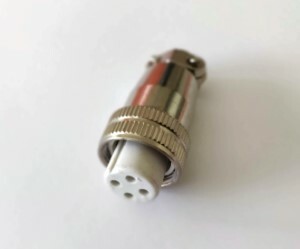 If there is a 25 pin female port on the back of your computer, and the breakout board has a male connector then this is the cable for you. Features: Direct through connection for each pin, shielded, 6.56 feet long (2.0 Meters), beige color, lead free and RoHS compliant. 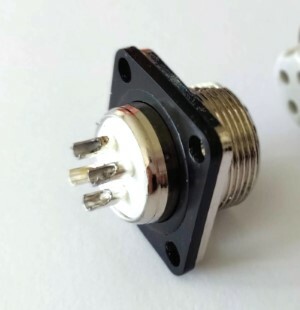 This is a 4 pin replacement connector for typical spindles used in CNC routers and CNC machines. Drivers: Will translate the signals to what the stepper motors will understand, and amplify the translated signals to turn the motors. As you can see, there are loads of information silk screened on to the case for easy wiring. That funny looking striped metal piece is for heat dissipation, since these driver chips can get hot. 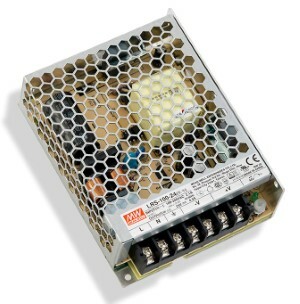 Specifically, these drivers will be able to accept 24 to 40 volts with current up to 3 amps. Think of amps as the muscle and volts as how fast the muscle can be brought into the motors. These also enable microstepping at half, quarter, fifth, eight, tenth, 1/25, 1/32, 1/50, 1/64, 1/100, 1/128, 1/200 and 1/256 (whew, that was tiring). It even has protection circuitry within for overheating, over voltage and over current. 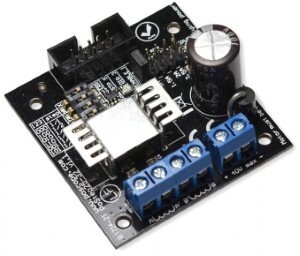 there are dip switches for easy current switching and this driver will accept 4, 6 or 8 lead motors. Oh yeah, the most important thing, thiese puppies have idle current reduction. 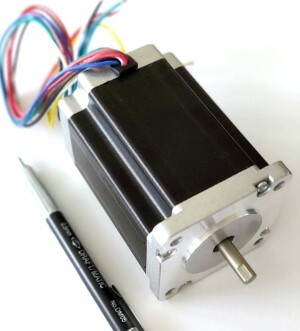 Stepper Motors: Provide the linear motion. When the driver sends a combination of current to the coils of the motors, it will turn 1.8 degrees, or tighter depending on the microstep setting on the drivers. That is, if you have half step, then the shaft will turn .9 degrees per step, quarter step .45 degrees per step, and so on and so on... These are NEMA 24 motors (standards terminology which only refers to its faceplate specifications and measurements), but don't let the size fool you, these motors can hold at 382 oz-in or 425 oz-in of torque (depending on availability). The current rating is 2.8 amps and 4.17 volts, so you will need a power supply that can be drawn at 8.4 amps, which is a nice segway to the power supply. Shaft sizes for the NEMA 24 are 1/4" and NEMA 34 are 1/2", typically. If the motors are not turning, and you are wondering why? Below is a few simple steps you can take to localize the issue. These steps assume that you have Mach3 or another control software installed and the interface requires a parallel cable. 1. To determine if there is a signal coming out of your computer, you will need to probe the port on the back of the computer and jog to see if the voltage changes. You will need a multimeter. Test each pin that you set as output. If no signal, it is a software or computer problem. 2. If there is a signal at the port, plug in the parallel cable and test the other end to see if the cable is showing output. if not, the cable is bad. 3. If there is a signal from the parallel port, probe the respective pins on the breakout board, if not, then the breakout board may not be configured properly (jumpers). 4. If there is a signal, you are half way there. Then we will need to check the drivers. 1. Before we start properly, if you haven't already, disengage the transmissions by taking the chains off the sprockets to avoid an un-expected movement that might damage you or your machine. Also, be sure you don't electrocute yourself either -- unplug the logic system when you are working in the wiring (and be careful when you are testing). Disconnect your parallel cable for now (as long as you are at it, make sure you have the right cable -- you need a Straight Thru Serial DB25M/DB25M like this one [ http://www.amazon.com/Belkin-25ft-Straight-Serial-DB25M/dp/B00004Z5W7 ]). Also, restart your machine just to make sure you are starting fresh. This will give you immediate feedback on which pins are conducting at hi and lo voltages. Remember: "In TTL circuits, any voltage between 0 and 0.8 volts is called "lo" and any voltage between 2.4 and 5 volts is called "hi"." 3. Double-check your "Ports and Pins" configuration. 5. In the Program Run screen, jog the X-axis a few times back and forth while looking at the parallel monitor. You should be able to jog the X and Y axis by hitting the arrow keys on your keyboard, but if you hit the Tab button, you can bring up a jogging sub-screen that will let you jog it with the mouse. Note the location and colors of the pins on the top right corner of the array (pins 1 through 7) and how they change when you change direction. Note that pins 3, 5 and 7 will change from Lo to Hi when you alternate directions. 6. Confirm these values by testing the parallel port connection in back of your PC. You will need to look closely to find the pin numbers on your port because they are printed very small, but they should be back there. 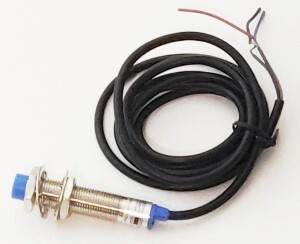 Insert the black probe into the #1 Pin (should be Lo) and probe each successive pin (2-7) with the red probe. Do the voltages correspond to the values being reported by the parallel port monitor? In my case, the Lo signal was 0.0 - 0.1 Volts and the hi signal was 3.3 Volts. Change directions a few times to confirm. If not, your problem lies before the parallel port output from your PC. 7. 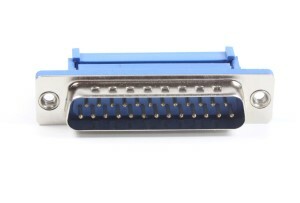 Now connect the parallel port cable to the back of your PC *but not your breakout board yet*. Re-test the voltages at the end of the cable the same way you tested them in back of the PC. It will be a bit trickier this time because you have to contact the pins instead of letting the probe be held in the holes, but it's manageable. Are you getting the appropriate voltage readings? If not, you might have a bad/wrong cable. 8. Now you can plug the parallel cable into the breakout board again and plug in the breakout board and driver power supplies -- there should be LED lights lit up on every component. You will notice that Mach 3 will go into EStop mode because you now have a hi signal going to the PC, so go back into Config/Ports and Pins/Input Signals/EStop and toggle off "Active Low". Hit the reset button and try jogging the X-axis a few times. If nothing happens, move onto the next step. 9. Check the power-supply wiring to the breakout board. Is the light on? If not you might have your circuit reversed. Is there a loop running from the 5V power supply to the "EN" pin on the board? If not your board is not engaged. Test it by placing the red probe on the 5V pin and black probe on the #2-7 output pins. If your board is engaged properly, the Hi signal output should be about 5.5 Volts (note the increase in voltage). If it is not engaged, it will be running about 1.5 Volts on each pin. While this is by no means a comprehensive trouble-shooting guide, it should help you isolate any issues you might be having in your system and hopefully get you started a little sooner.